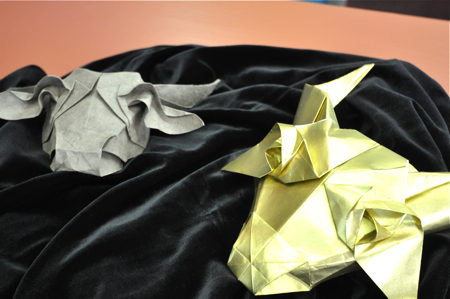 Check out the origin of the origami butterfly on the cover of Enchantment. 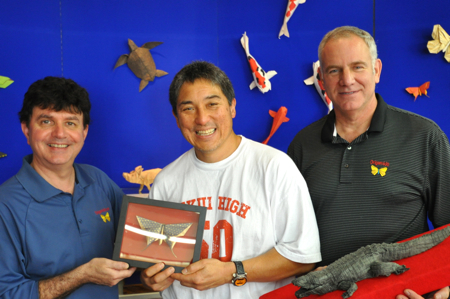 By good fortune, the guys who made the origami butterfly for my book cover and I were in Hawaii at the same time. 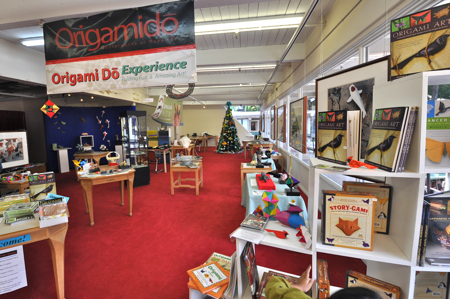 Here are pictures from my visit to their shop, Origamido, in the International Market Place. 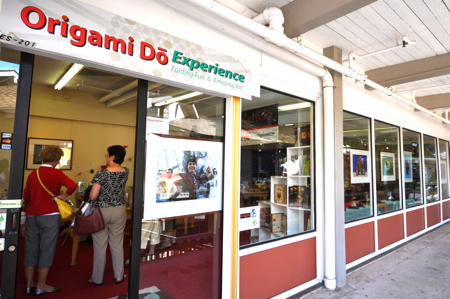 The shop is on the second floor of the Diamond Head end of the Center. 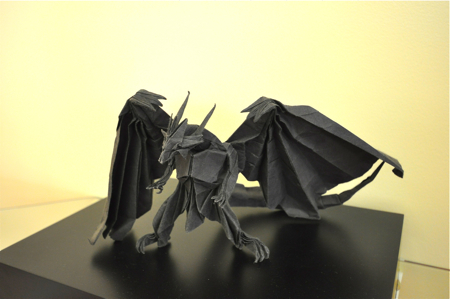 Michael G. LaFosse (l) designed and folded the Kawasaki Swallowtail. Richard Alexader (r) made the paper. 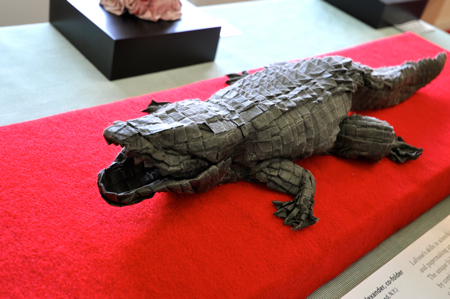 “Snap” the origami American Alligator designed by Michael LaFosse, one square of 6’ x 6’ Origamido® paper made by Richard Alexander, folded by both LaFosse and Alexander over a period of fifty hours. 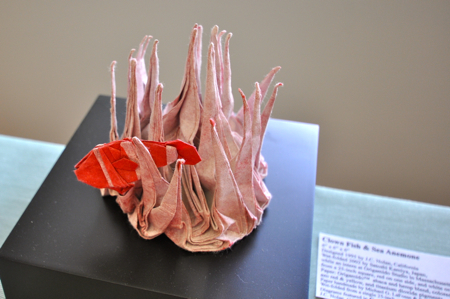 “Clown Fish & Sea Anemone” designed by J. C. Nolan, folded by Satoshi Kamiya at Origamido Studio from Origamido® paper. 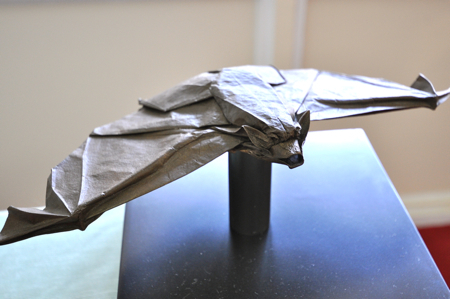 “Big Brown Bat” designed and folded by Michael G. LaFosse from handmade Origamido® paper. 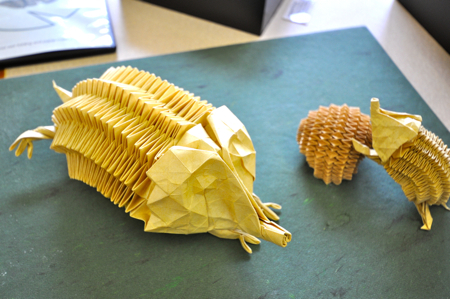 “Echidna Family” designed and folded by Eric Joisel, each from a single, uncut square. 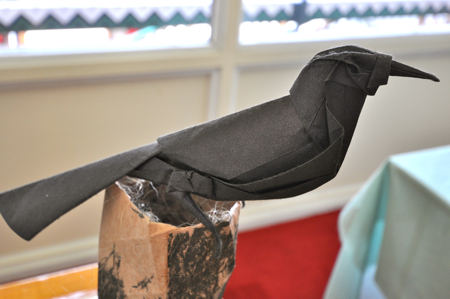 “Flaxen Grackle” designed and folded by Michael G. LaFosse from a single, uncut square of Origamido® paper. 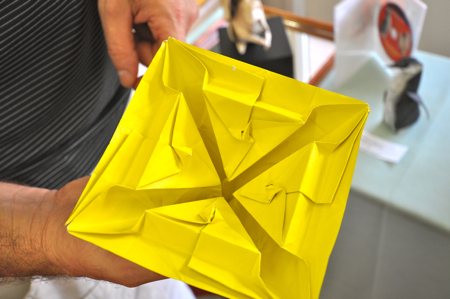 Under side of indented, four-sided pyramid, designed and folded by Ethan Plaut. 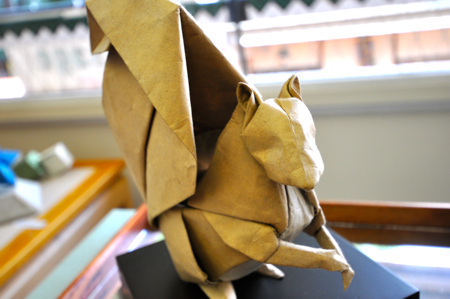 “Squinny” the origami squirrel, designed and folded by Michael G. LaFosse from Japanese paper backed with Origamido® paper. 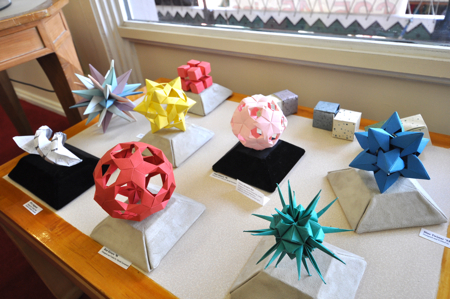 Display of several pieces, clockwise from left (9 o’clock) DNA Strand by Thokki Yenn, folded by Richard Alexander, 30-Spike Ball and red Cube Cubed (eight Joined cubes) designed and folded by Satoshi Kamiya; Two-cube series (Joined at whole face, half-face, quarter-face — designed and folded by Ushio Ikagami; Various modulars from rectangles: Yellow Star Pod, Pink Sakura, Blue Twist Star, Red Kirara. 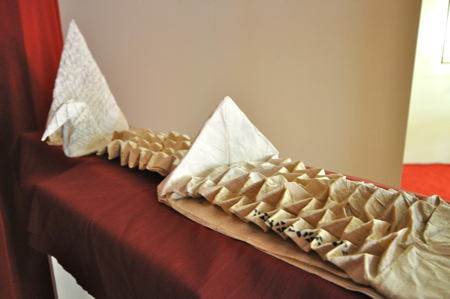 Green Radiolaria from 12 squares, all designed and folded by Miyuki Kawamura. 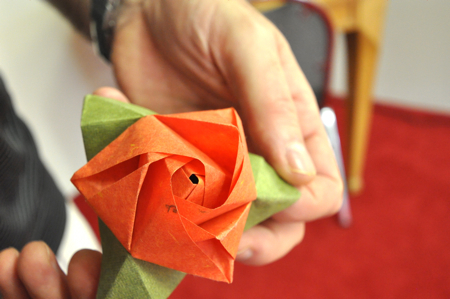 Magic Rose Cube designed by Valerie Vann, folded from six squares of Origamido® paper by Richard Alexander. 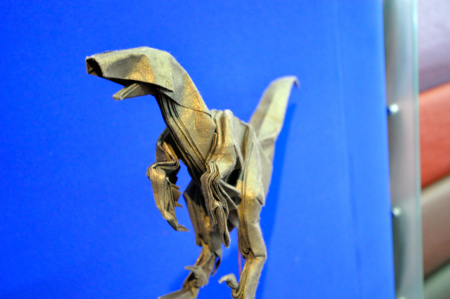 “Flapping Bird” surface study by Scott Macri in his own handmade paper. 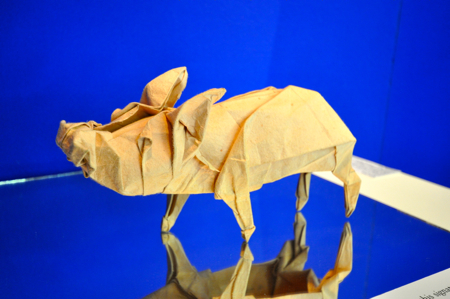 13) “Wilbur” designed and folded by Michael LaFosse in his own handmade paper. 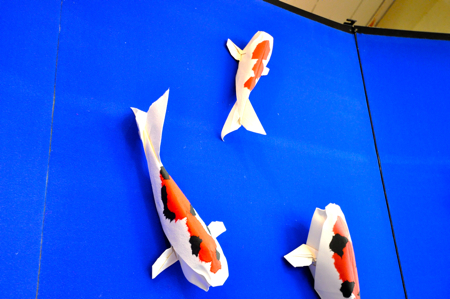 Koi designed and folded by Michael G. LaFosse from white watercolor papers with torn appliques of red and black Origamido® paper. 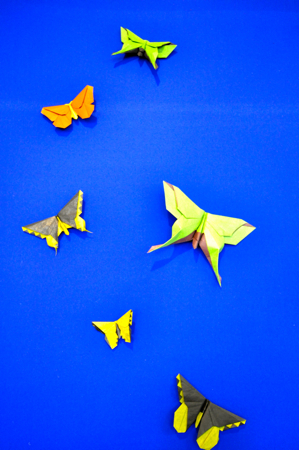 Various origami Butterflies designed and folded by Michael LaFosse from Origamido® Duo papers by Richard Alexander. 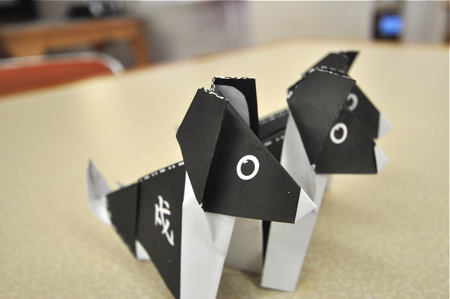 Precursors to the Kawasaki Swallowtail! 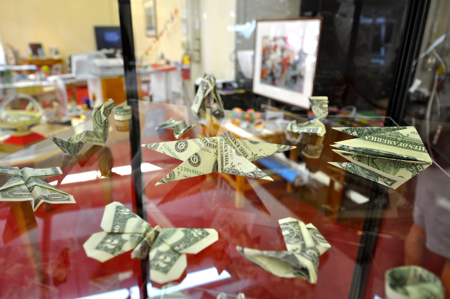 Display of “Money Origami DVD Kit” projects, folded by LaFosse and Alexander. 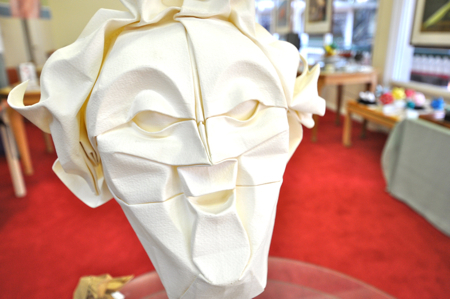 Mask by Eric Joisel of white watercolor paper. 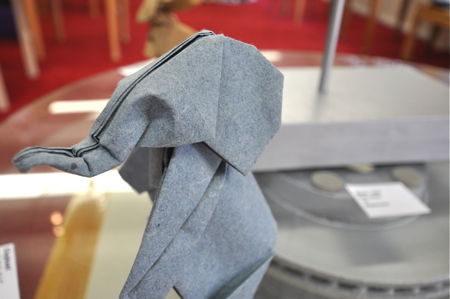 Elephant designed and folded by Joseph Wu. 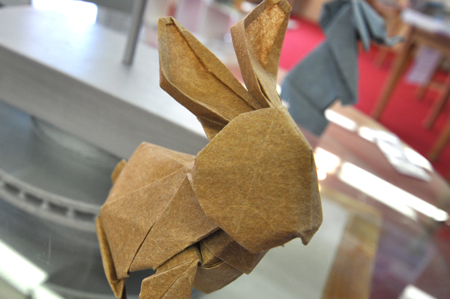 Rabbit designed and folded by Joseph Wu. 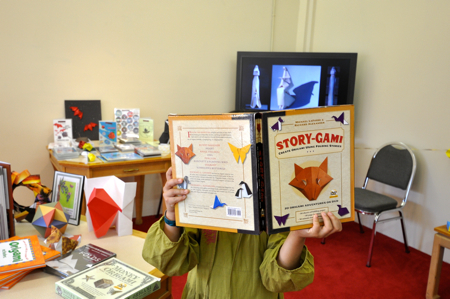 My daughter and I got some hands-on instruction. This is how I used Michael and Richard’s design for my cover. 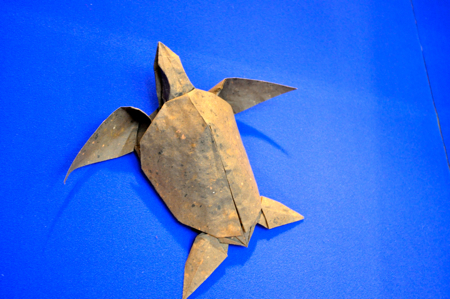 When you’re in Honolulu, be sure to visit Origamido. 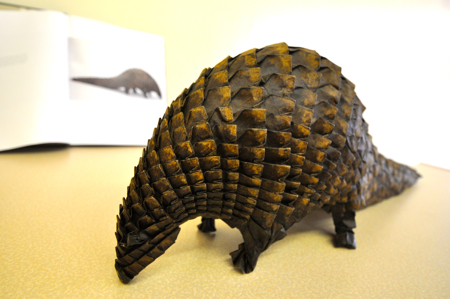 You’ll be amazed at what you’ll see, and Michael and Richard are super nice people.